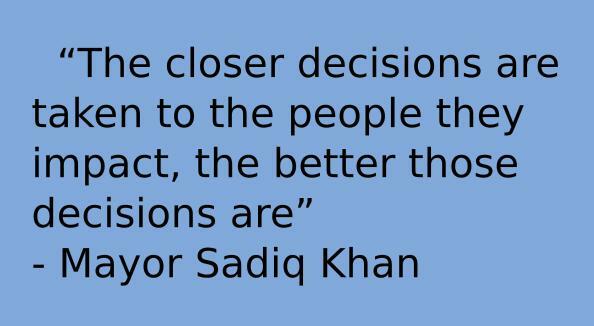 ​When are you going to start listening to us Mr Khan? TfL’s public consultation for Cycle Superhighway 11 closed on 20 March 2016. TfL published a summary of consultation responses on 3 August 2016 asserting that no decision had been made on the scheme. 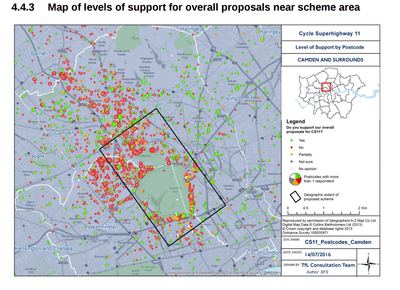 When briefing the press TfL claimed to have a 60% level of support for the scheme. However, TfL failed to include the 3,873 objections which were lodged by petition. If these objections had been included there would have in fact been a clear majority opposed to the scheme. This is a scheme designed to displace the free-flowing arterial traffic of Swiss Cottage and turn it into stop-go congestion on the residential streets of Hampstead, Belsize Park, St John’s Wood, and neighbouring communities. This scheme dramatically restricts access to routes through Regent’s Park by closing most of the gates for the majority of the day. TfL have assembled a stakeholder engagement group which has been meeting fortnightly to assess CS11. It comprises TfL, Camden and Westminster councils, The Royal Parks, cycling organisations, and residents from both sides of the debate. Nothing in the stakeholder meetings suggests that TfL are listening to the residents. Answers to questions are not forthcoming and the mitigations offered are insignificant. TfL are largely unaccountable to the people of London. They are masters of their own road network, but they cannot realise this scheme without taking into account borough roads controlled by Camden, Westminster and The Royal Parks. Camden and Westminster councils are democratically accountable institutions. Westminster expressed its opposition to CS11 in a consultation response. Camden expressed qualified support but with significant reservations. Join us to make your voice heard and send a message to our elected representatives and to TfL that the harmful impact of the superhighway on surrounding streets is out of all proportion to any benefit it might bring. 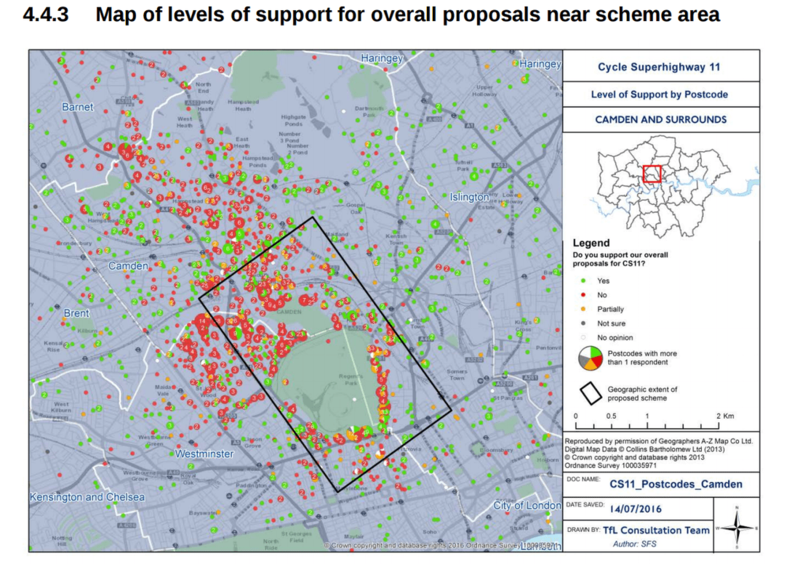 As Tfl, Westminster, and Camden Councils and Royal Parks understand only too well - the current road network along the CS11 route (especially in and around the Swiss Cottage area) which is one of the main arteries into and out of London, currently operates on a very thin margin of error. When this artery is blocked, the rest of London feels the heart attack. As we have witnessed in the past year, it only takes the slightest disruption (utility works, lane closures, fires, etc) to cause catastrophic traffic congestion, forcing vehicles to avoid the gridlock by taking alternative routes - residential side roads - which rapidly fill up with long lines of idling traffic, pumping out harmful emissions, already adding to the extremely high levels of air pollution. This scheme is planned on THE major arterial route carrying traffic from as far as the North of England down the M1 into Central London and if implemented will cause huge congestion and increased air pollution, putting the lives at risk of many thousands of people in the affected surrounding areas. The air pollution levels in Hampstead already exceed national safety pollution levels. According to a 2010 Kings College Study in the London Borough of Camden (which has been designated an "Air Quality Management Area" for Nitrogen Dioxide and PM10s) 264 people were killed due to high levels of pollution. Cycle Superhighway 11 is designed to push traffic off the Finchley Road and into already congested residential areas. This will raise pollution levels further and be responsible for more deaths. By reference to the intention to push traffic into the already highly polluted areas, according to experts, CS11 will breach the EU air quality directive 2008/50/ec which makes the scheme illegal. For that reason alone, the scheme should be scrapped. This scheme is totally illogical as, far from reducing "rat runs", it will CREATE rat runs by forcing large volumes of traffic, including lorries, trucks, and vans to divert from the main roads (FInchley Road, Avenue Road, and Park Road) down the currently quiet, narrow, residential side roads of West Hampstead, Hampstead, Swiss Cottage, Belsize Park, St John's Wood, Primrose Hill, and the Regent's Park. At a time when London's emergency services are stretched to breaking point from increasing demand, diminishing resources, and financial cutbacks, why would TfL introduce a road scheme that will clearly put thousands of people's lives at risk through an increase IN the response times for fire engines, ambulances, and police vehicles - they will simply be blocked and won't get through the road network at peak times of the day? The roads along the proposed CS11 route are already littered with speed bumps, width restrictions, and challenging traffic conditions and CS11 will only exacerbate them. This scheme is unworkable and unviable because by closing the 4 main gates at Regent's Park as proposed, you are cutting off vital diversion routes for emergency vehicles and ordinary traffic in the event of a road traffic accident, fire, terrorist act, roadworks, breakdown, or any other event that may occur on the road. What will happen in case of any of the above when the traffic is gridlocked in all the surrounding roads and the gates are closed? HS2 is closing other roads down which this scheme specifically intends to direct traffic so that gridlock is guaranteed. 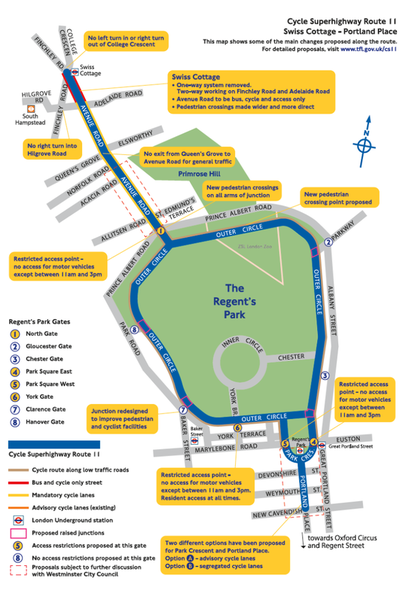 If it is the aim of the Royal Parks and TfL to return Regent's Park "to its original purpose as a park" then why does CS11 involve the closure of 4 of the main gates but leave the others open, forcing the previously well-distributed flow of traffic through 8 gates into half that number? Can the planners not see that the very large volumes of traffic that will be forced to use half the number of open gates will cause long tailbacks and thus very unfavourable and unsafe road conditions for cyclists using the Outer Circle? Through the lobbying of racing cyclists, Regent's Park management have reduced the 14 speed bumps to 4. Racers around the park regularly post their speeds, some of which exceed the 20mph limit. How is that calming traffic? Parents with multiple children who require a vehicle to safely transport them along with any buggies, car-seats, shopping, etc. May tens of thousands of local residents whose ability to travel freely across North West London (Primarily in the East-West/West-East direction) will be SEVERELY impacted due to the many road closures and severe traffic congestion caused by CS11 and HS2. For example, with the planned closure of Queen's Grove (at junction with Avenue Road) and the closure of Adelaide Road due to the HS2 ventilation shaft, how will anyone be able to reach Primrose Hill/ Chalk Farm from NW6, NW3, or NW8? And all this at a time when TfL are advising the public not to travel on certain tube lines during the day to congestion. Many bus routes are filled to bursting at peak times and commuters suffer long delays in waiting times. Are we all due to be confined to our homes? This is in addition to the severe likely impact on congestion and pollution from the Baker Street 2 way system scheme. Therefore surely CS11 can only be placed under consideration if the Traffic Models include all of this available data in order to make them fair, accurate, representative, and useful.